NEW YORK, New York, September 26, 2013 (ENS) – Seven African countries and a host of conservation groups today made an $80 million Clinton Global Initiative Commitment to Action to stop the slaughter of Africa’s elephants for their ivory tusks. African elephants are being lost at an unprecedented rate. Tens of thousands of elephants are being killed illegally each year across Africa; some 35,000 were lost in 2012 alone. 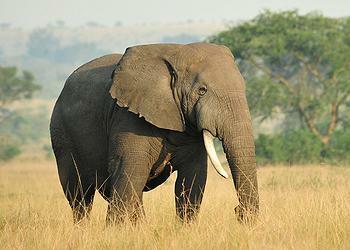 Elephant numbers have dropped by 76 percent since 1980 due to ivory poaching. Increasing consumer demand for ivory, particularly in Asia, is causing the price of ivory to skyrocket and is driving elephant poaching. Today’s ivory traffickers are often well-organized, well-armed syndicates that operate as transnational criminal networks with links to terrorist networks. 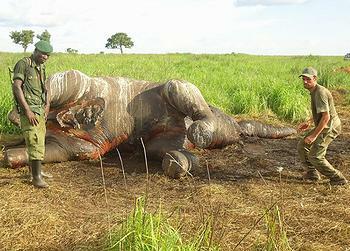 The poachers threaten the lives of park rangers as well as elephants. At least 1,000 rangers have been killed in the line of duty over the past 10 years. The commitment runs through 2016 and aims to create a global movement that addresses the problem on three fronts: stop the killing; stop the trafficking; and stop the demand. Funding for this commitment has been provided by public and private sources, including U.S., European, and African governments; along with multilateral institutions, foundations, and concerned individuals. Nations joining in the commitment include: Botswana, Cote D’Ivoire, Gabon, Kenya, South Sudan, Malawi, and Uganda. NGO commitment makers and their partners are: African Parks Network, African Wildlife Foundation, Association of Zoos and Aquariums, Conservation International, Frankfurt Zoological Society, Freeland Foundation, Howard Buffett Foundation, International Conservation Caucus Foundation, International Fund for Animal Welfare, National Geographic, Save the Elephants, the wildlife traffic monitoring network TRAFFIC, WildAid, Wildlife Conservation Society, WildLifeDirect and World Wildlife Fund. The funds will be used to support national governments as they scale up anti-poaching enforcement at the 50 priority elephant sites. They will be hiring and supporting an additional 3,100 park guards. In addition, anti-trafficking efforts will be increased by strengthening intelligence networks and penalties for violations and adding training and sniffer dog teams at 10 key transit points. New demand reduction efforts will be implemented in 10 consumer markets over the next three years. Leaders from African partner nations have issued a call for other countries to adopt trade moratoria on all commercial ivory imports, exports and domestic sales of ivory products until African elephant populations are no longer threatened by poaching. In addition to the funds already committed, the partnership “urgently” seeks additional partners to provide $70 million in financial or in-kind support over the next three years to reverse the decline of Africa’s elephants. 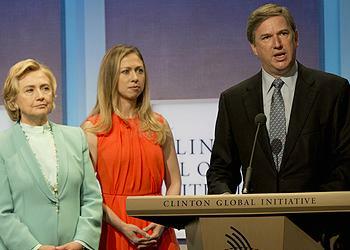 The commitment was announced at the Clinton Global Initiative Annual Meeting underway in New York City. CGI’s 2013 theme, Mobilizing for Impact, explores ways that CGI members and member organizations can be more effective in leveraging individuals, partner organizations, and key resources in their commitment efforts. Today’s announcement is the result of work by former U.S. Secretary of State Hillary Clinton, as well as the work of Clinton Foundation Vice Chair Chelsea Clinton, who visited conservation sites in Africa this summer. Conservation International Co-founder, Chairman and CEO, Peter Seligmann, said, “We applaud the Clinton Global Initiative for bringing this issue to the world stage, and greatly appreciate the deep and sustained personal involvement of Secretary Clinton and Chelsea Clinton, as well as that of our NGO, foundation and government partners. The Wildlife Conservation Society also launched its own campaign to protect elephants from slaughter. Called “96 Elephants,” a reference to the number of elephants now gunned down each day by poachers, the WCS campaign focuses on securing effective U.S. moratorium laws; bolstering elephant protection with additional funding; and educating the public about the link between ivory consumption and the elephant poaching crisis. In addition to uniting national leaders and concerned groups and citizens, the commitment will focus attention on the national and global security implications of wildlife trafficking. Elephant poaching is one of the world’s most lucrative criminal activities, valued at $7-10 billion annually, and the illegal wildlife trade ranks fifth globally in terms of value, behind the trafficking in drugs, people, oil and counterfeiting. Notorious extremist groups like the Lord’s Resistance Army, the janjaweed, and al-Shabaab poach ivory to fund terror operations. To stop the killing, partners will scale up “on the ground” anti-poaching enforcement in African range states to reduce the number of illegally killed elephants to below 50 percent of their present levels. NGO partners will support government efforts to scale up law enforcement in and around 50 key protected areas in Africa that together harbor some 285,000 elephants, or roughly two-thirds of the entire African elephant population. They pledge to support the anti-poaching efforts of over 5,000 park guards at these sites. Partners project that this investment will reduce the average percentage of illegally killed elephants across these sites from 66 percent to 48 percent, with elephant population decline halted in about half of the 50 sites. To stop the trafficking, partner NGOs will support governments to strengthen enforcement capacity at ports and markets, increase intelligence-led crackdowns on illicit networks, secure ivory stockpiles, and reform laws and penalties tailored to rapidly reduce trafficking. The partners commit to helping governments reduce the number of large scale ivory shipments by half from 2011 levels; 2011 was the worst year on record for these ivory seizures. In addition, the partners will work with governments to increase, by 2016, the number of law enforcement officers and judiciary trained in Africa and Asia by 50 percent compared to 2011 levels. To stop the demand, commitment partners will target key consumer markets to increase awareness about poaching and illegal ivory trade. They pledge to generate 10 million actions taken via social media platforms to reduce ivory consumption. They will produce information to raise awareness of the issue and improve penalties and prosecutions to spur behavior change in key consumer countries. To measure success, standardized, replicable, scalable public opinion polls and surveys will be conducted within priority consumer countries. NGOs will use increased awareness to drive behavioral changes that will reduce consumption and put political pressure on the governments of key ivory consumer countries. The goal is to reduce the purchase of ivory by at least 25 percent in key markets by the end of 2016 as measured by market research conducted throughout the three-year duration of the commitment. Established in 2005 by President Bill Clinton, the Clinton Global Initiative, an initiative of the Bill, Hillary & Chelsea Clinton Foundation, convenes global leaders to create and implement innovative solutions to the world’s most pressing challenges. CGI Annual Meetings have brought together more than 150 heads of state, 20 Nobel Prize laureates, and hundreds of leading CEOs, heads of foundations and NGOs, philanthropists, and members of the media. To date CGI members have made more than 2,300 commitments, which are already improving the lives of more than 400 million people in over 180 countries. When fully funded and implemented, these commitments will be valued at $73.5 billion.